Sit-stand leaning and perch stools are NOT chairs. 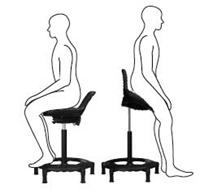 These stools support healthy spinal alignment only when used in an open hip posture (e.g., > 130-degree hip angle). Some manufacturers claim that sit-stand stools can also be used at a conventional chair height. We simply disagree. Experience optimal energy and spinal alignment in a supported standing posture. Move follows your movement. Comfortable 15" saddle seat. Which sit-stand stool to choose? Kneeling chair vs saddle seat - which to choose?